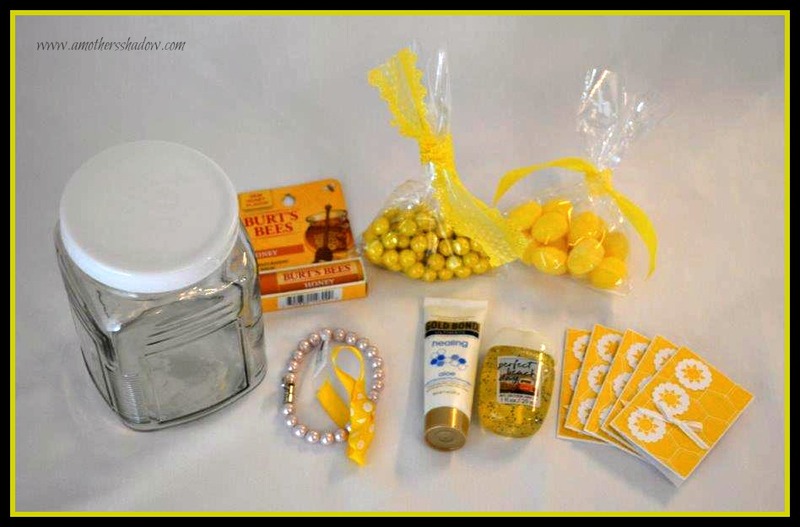 When a friend, co-worker, family member, a neighbor could use cheering up, a SunShine Gift or Basket is the solution. 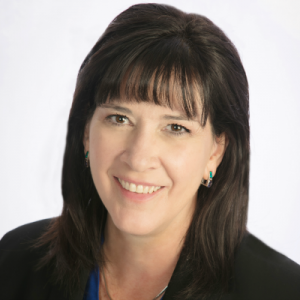 If they have had a difficult trial to go through, a job loss, health struggles, family issues, financial reversals, or just had a very bad day, a SunShine Gift or Basket is the answer. 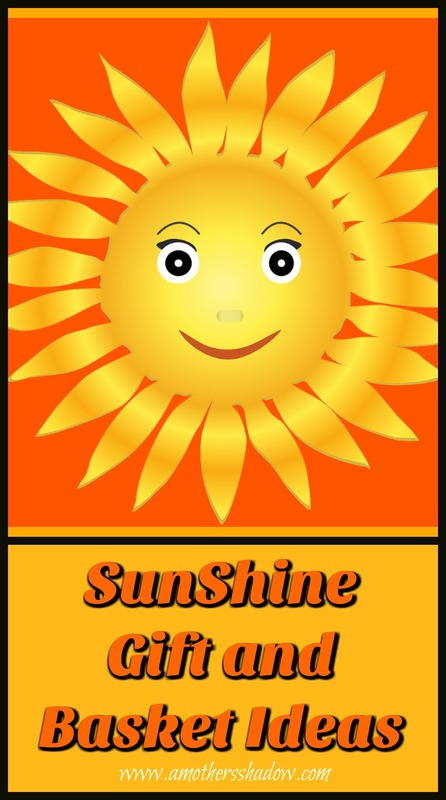 What is a SunShine Gift? 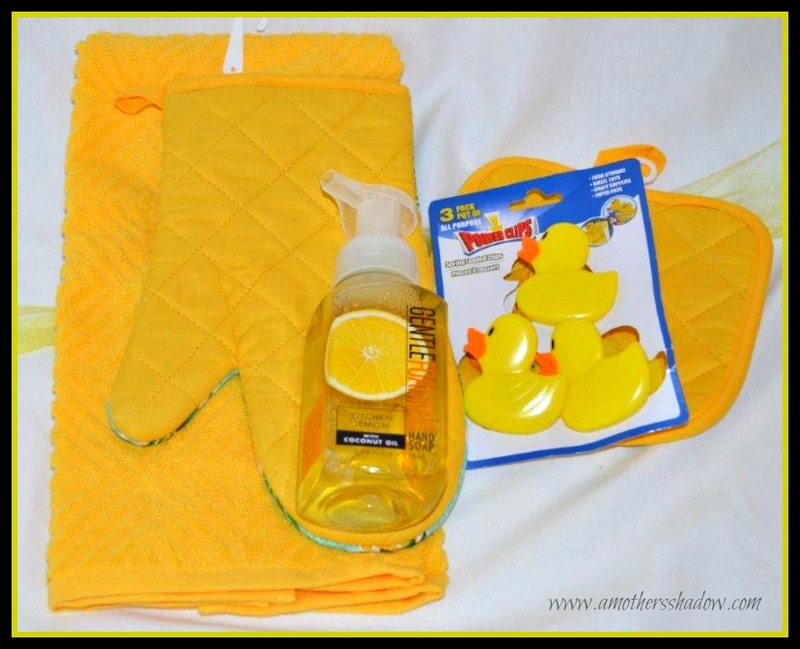 Why everything in it is yellow of course! 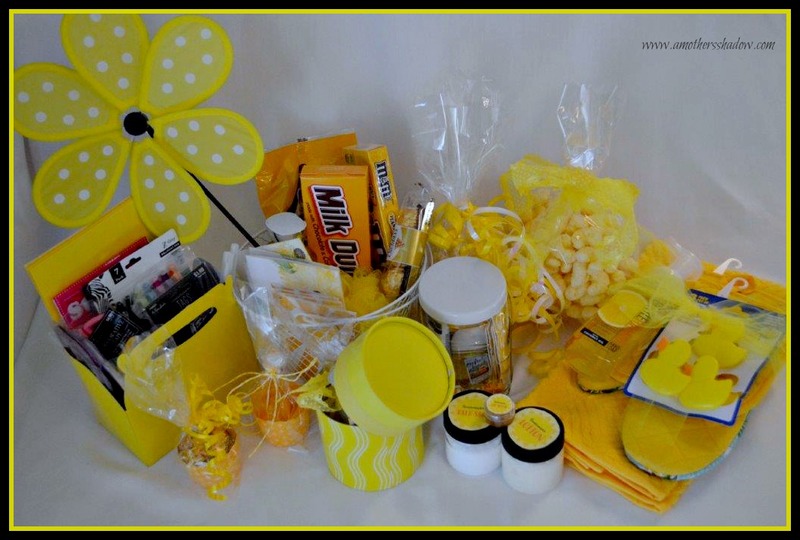 Just like the sun brightens the day, the treat, or gift is yellow to bring cheerful, happy feelings and thoughts to the person receiving the SunShine gift. Really, you just have to smile when you are given an all yellow present! 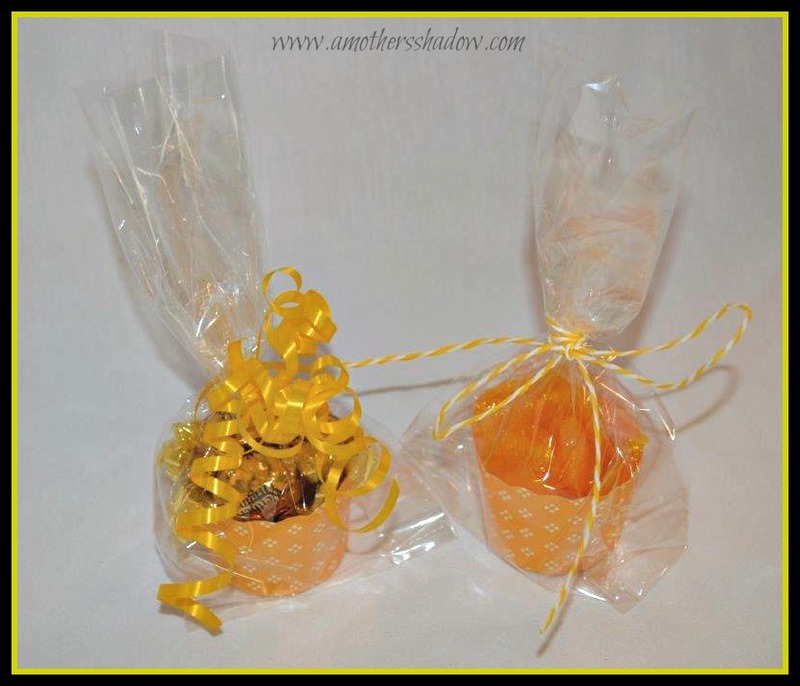 Treat cups are a perfect way to give a little treat and let someone know you are thinking of them. Depending on how many you want to do, and the size THIS and HERE are good options. In the bag on the right are my WHITE CHOCOLATE LEMON COOKIES. They are super yummy and would sweeten anyone’s day. 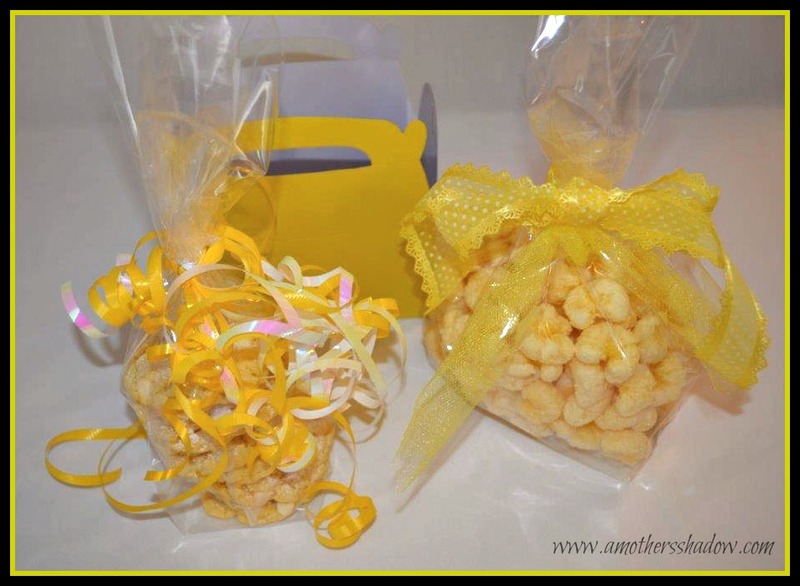 Put either goodie in a cellophane bag with a yellow ribbon, the tag I linked above, and deliver or in the yellow box HERE and tie the tag with a ribbon on the outside with the cellophane bag of treats on the inside for a delicious surprise. Kitchen items like these are always appreciated as well as useful too. 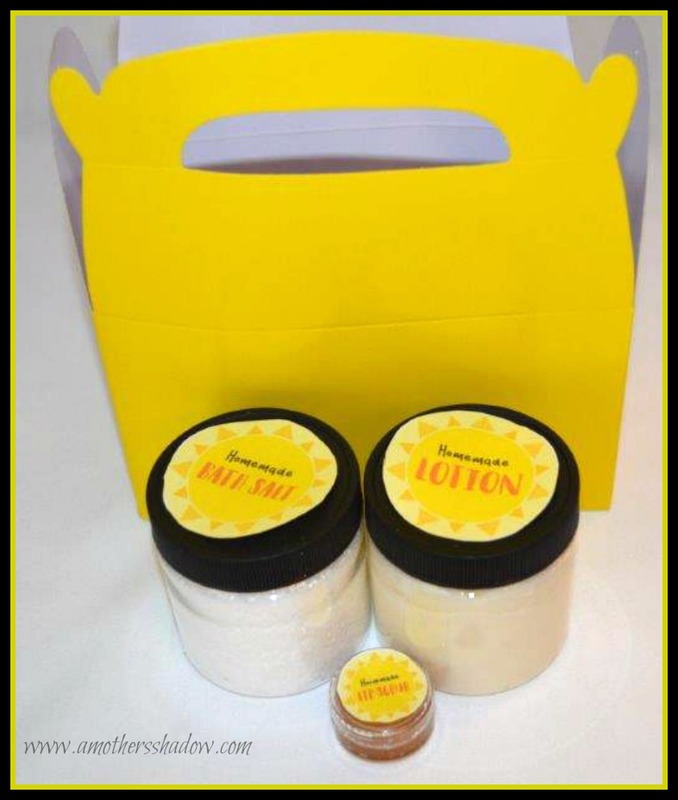 HERE is the 4 ounce jar with lid that I used in the picture for the lotion and the bath salts. 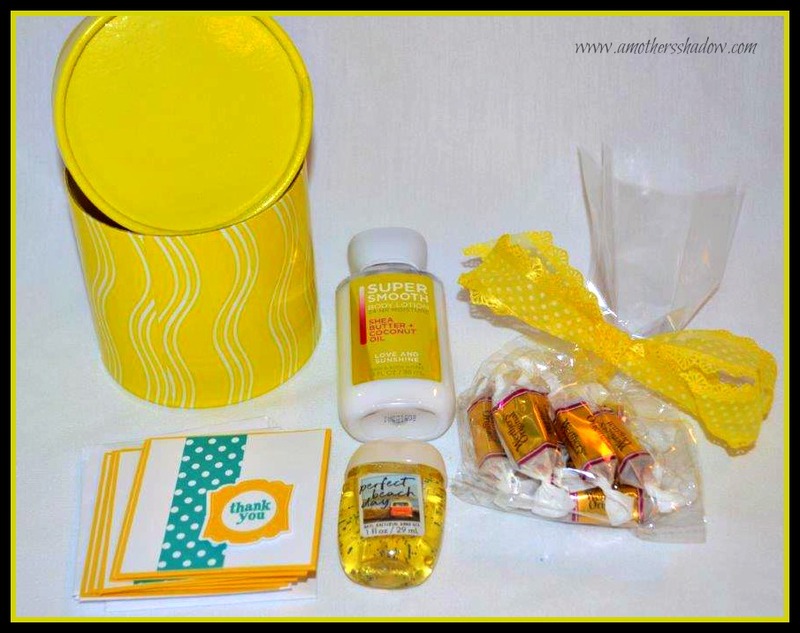 It’s the perfect size for stacking in a cellophane bag or the yellow box. The tag link is at the top and has labels for all of these. Of course a jar of any size you like will work. Fill it with what the person you are giving it to would enjoy. The adorable CARDS ARE BY NATALIE can be ordered through her. 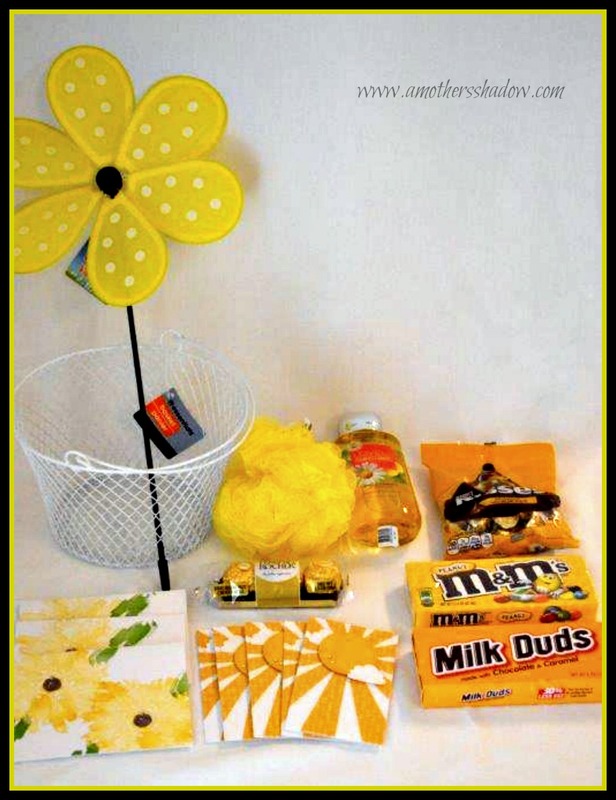 A fun basket with bath gel, a loofah, good candy, and great cards would make any stormy day be sunny. The cards in the middle are also by NATALIE and can be ordered through her, as well as many other designs to match this and other occasions. If you know the person well, you can personalize it like I have with this box. 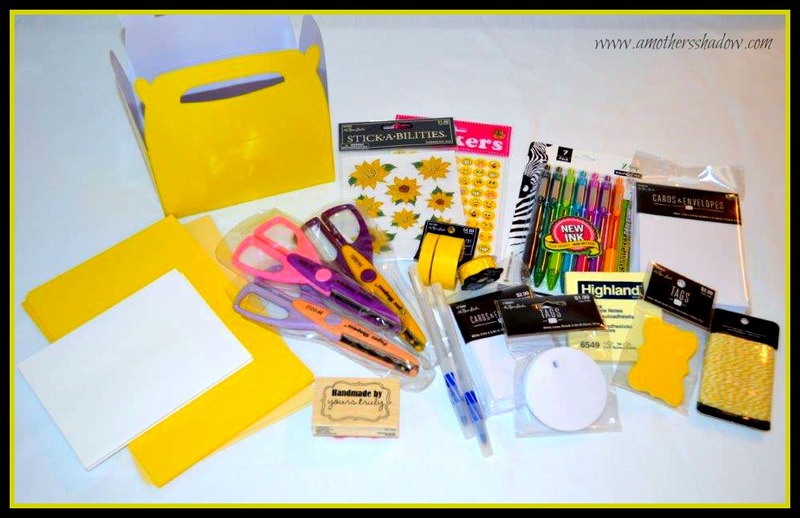 In this box I have: yellow note cards with envelopes, yellow stickers, yellow and white tags, a fun stamp, yellow craft twine, gel pens, craft scissors, pens, yellow craft ribbon, yellow washi tape and I just might toss in some chocolate when I deliver it. Kids have terrible, horrible, rotten, no-good, very bad days too. Sometimes illness, surgeries, and regrettable, just hard things to deal with sometimes. 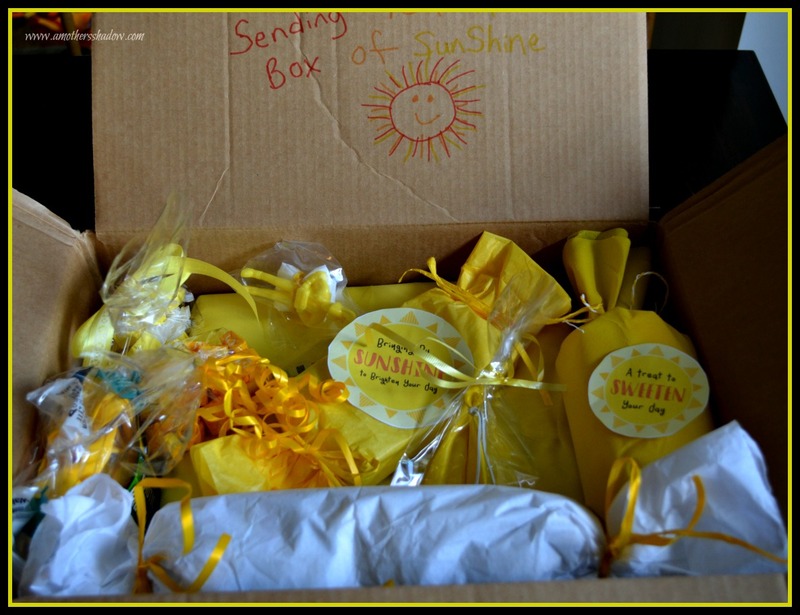 So take or send them a YELLOW SUNSHINE GIFT BOX too! 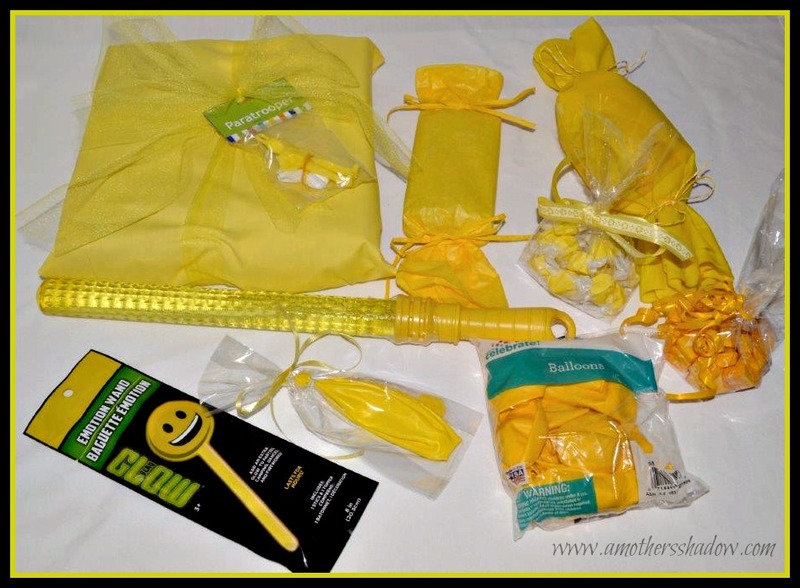 Here I have: a glow stick, yellow punch balloon, bag of yellow balloons (kids can never have enough balloons – right? ), yellow bubble wand, yellow taffy, yellow starburst candy, three presents, AND… let me point out that one of the gifts is wrapped in tissue paper and the other two gifts are wrapped in fabric. That’s right! I could not, in any local store find yellow wrapping paper! So I went to the craft store selling fabric and purchased the most inexpensive yellow fabric that was on sale, along with a yellow remnant to give me two pieces of yellow fabric to use as wrapping paper. Be creative and use whatever works. Never forget that white is always a great choice. Simply decorate it with yellow flowers, ribbon, bows and even toys. Did you notice the yellow Parachute Man tied onto the top of the one package? 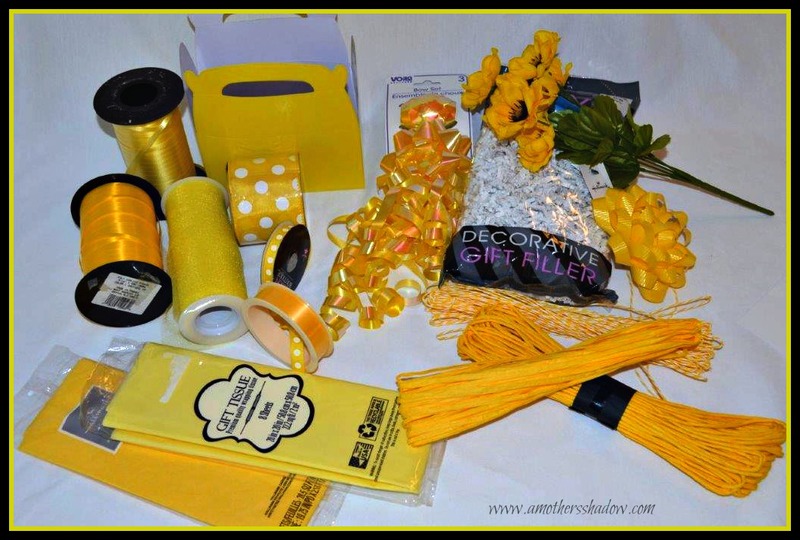 These are some of the supplies that I used in making the SunShine Gifts and Baskets. Make sure to check out my post HELPING A SICK FRIEND AND COMFORTING IN HEARTBREAK for more information, resources and ideas. I hope you enjoy making up SunShine Gifts and please let us know what you made and send pictures!